The Atlantic Coastal Action Program (ACAP) Cape Breton is a non-profit charitable community organization. Established in 1992, the original mission was to develop a comprehensive ecosystem management plan for the watershed area of industrial Cape Breton. ACAP Cape Breton has grown into a dynamic organization that integrates the following core areas into its day-to-day operations: science and monitoring based projects, electronics recycling, social marketing, and education and awareness. 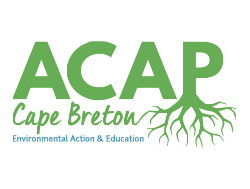 ACAP Cape Breton’s Vision is for a clean and healthy environment, a prosperous economy and a population that is educated and empowered to make responsible choices for a sustainable future.